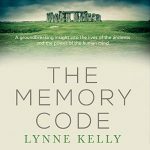 There has been a great enthusiasm from readers of The Memory Code to learn to create memory devices and implement them in their own lives. 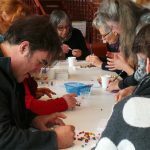 Twenty people gathered for the first workshop at Castlemaine Library on a Saturday morning. The goal was to learn two different methods inspired by indigenous knowledge experts. The first technology was to imitate the memory board known as a lukasa from the Luba people of West Africa. Variations of memory boards are found all over the non-literate world. The first stage was to select pieces of wood which had interesting grain which could be used to enhance the visual location of each bead. Then about 120 beads were selected from a large selection, for looks and for touch. 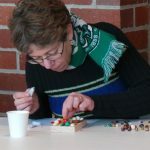 Each person chose the beads which most appealed to them. These were then glued onto the boards and left to dry. We then spent about half an hour creating a memory palace in the participants’ homes. They started encoding the countries of the world in population order to locations within their houses. One has reported back that she got the first 80 in within a week! The information about the countries in each location is infinitely expandable. See Memorising the Periodic Table for the method. We then returned to the lukasas. Each participant had their own ideas about what information they were going to encode to their memory boards. These varied from birds, plants, Australian Prime Ministers and chemical elements to human anatomy. Each worked out the structure of the data they were using – some from sheets I had already prepared, some from lists or books they had brought. We have no elders to teach these things so have to rely on written records as the starting point. This followed the method I talked about in Memorising Birds. The feedback has been fantastic. People have really engaged with the methods and discovered, as I have, that having information in memory enables you to see bigger patterns, to have the information readily available and ask new questions. And it’s so much fun! This entry was posted in art of memory, history walk, indigenous memory systems, lukasa, memory, memory devices, memory palace, memory places, Memory Spaces, method of loci, mnemonics, songlines, The Memory Code and tagged art of memory, indigenous, memory palace, Memory Spaces, memory systems, method of loci, mnemonic devices, mnemonics, The Memory Code. Bookmark the permalink. 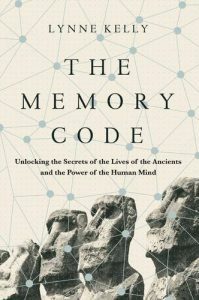 Loving The Memory Code – am presently walking the hills of Paddington (Brisbane) listening to it as an audiobook – the inspiration in these ‘pages’ seems to be as rich and non-linear as the methods you are explaining. I have particularly enjoyed your mythbusting, pragmatic and deeply respectful approach to indigenous intelligence. 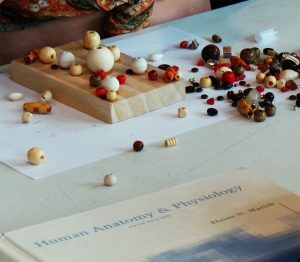 Would love to be part of a workshop – or maybe assist in setting one up – I am involved with a movement focused community in which I have been setting up live workshops but also low tech webinars – an ideal way to link people across distance with inspiring speakers – but also enables functional skills sharing. I too have a sad face story about being a terrible memoriser – so am very keen to start a thorough and rich learning of anatomy using your experiments as a guide – I think I will start with your explanation of the remembering the Periodic Table as a guide for learning Anatomy??? (any suggestions very welcome) I see from your events scheduled that you are extremely busy with book launching/promotion. If I can assist in keeping workshops on the simmer then please let me know. Thank you for such a lovely comment. I love the image of you walking the hills of Paddington and responding so beautifully to what I have 3written. I really appreciate the gorgeous way you have expressed it. 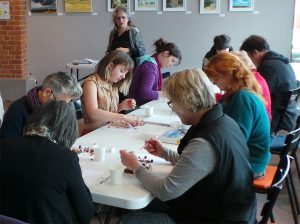 I would love to do more workshops – I am getting asked for them a lot. At the moment, my time is fully booked with talks and collaborations and preparing for the launches in New York and London in February. When I return in March, I will have a better idea how to plan the future. Please say in touch about the workshops, and when the fuss dies down I can see what is possible. As for setting up your own memory spaces, the easiest way is to just start. You will be astounded how easy it is and how soon you can see the way forward. The Periodic Table will be much easier than anatomy, simply because the information is already structured in a neat linear form. Having started on that, you will get the insight needed as to how you structure anatomy. I’d be very interested to hear your decisions about anatomy. I am working on that too. I play around with all the 33 memory experiments, just deciding which I’ll do depending on my mood. That is far more effective, I feel, than doing one domain exclusively. Because you have mentioned the periodic table, I will probably play with that when I am gardening today. I am finding ways to encode when I start a new line – a new period – from the rhythm with which I say them, and adding whether they are gas, liquid or metal at room temperature. Other details are going in by story, because each element becomes a character or effect. Some are easy – Boron is a very boring man. Phosphorous is explosive. Please let me know how your experimentation goes. Hi Lynne, I LOVED your book and would really love to know about future workshops and learning how to teach others how to do it. My nickname as a child was “sieve head” and my supposed poor memory was quite a stress for me. 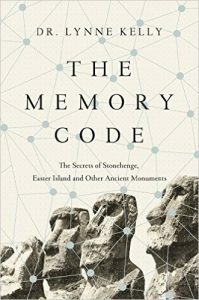 I discovered Jim Kwik’s work on memory techniques which really helped me to learn my students’ names (I teach international students and have to learn new names every 5 weeks). Your book just really inspires me to learn more of these methods. A second huge appreciation I have of your book is the deeper compassion and insight I have for indigenous people and their connection to the land. Just beautiful. I have liked your facebook page and would be very very interested to attend a future workshop. I live in an Ecovillage in Currumbin Valley in Queensland and I’m sure I could gather quite a group together in our community hall if you were coming this way. I understand you are busy and probably flooded with inquiries so I will keep an eye on your facebook page. Thank you so much for your gift to the world. Thank you so much for taking the time to write such a wonderful comment. It is hugely appreciated. I love your nickname. I was just constantly referred to as the vaguest child ever because my memory was so poor. I wish we’d been taught these methods at school. They work so well and have served indigenous people for thousands of years. We have so much to learn from them. At the moment there are no future workshops planned. I am doing lots of talks and have more writing commitments. I would love to do a workshop in such a beautiful part of the world. One day I hope that will happen. I will talk about everything on the Facebook page so it is great that we will stay in touch that way. I do hope that our paths cross one day in the real world. Thank you again for your lovely words. We came up to Currumbin many many years ago. So gorgeous! I am starting an experiment next week to expand my memorised bird guide from Victoria to all of Australia. I will be a guest at the Sunshine Coast Readers and Writers Festival where I will not only be talking about the book but meeting with Traditional Owners and getting time to chat about the memory methods and ecological knowledge. So exciting! Then, we are staying on for a few days and will start the task of expanding the 408 regular birds in Victoria to the 500 or so including vagrants and rare one, but also planning to go to the full list of over 800. My husband, Damian, is a very keen birder. I think I’ll start with adding all the honeyeaters. That should keep me quiet for a while! I think there are 51 in total, of which we have 36 in Victoria. I have them in taxonomic order, so don’t want to just add the extras on the end but where they fit in the order, because that gives me the similar birds together in the stories. Should be fun! I’ll blog about that, and mention it on my Facebook author page. Enjoy the R&W festival Lynne. That sounds wonderful and I wish I could be there to hear your talk. I will keep on an eye on your FB page. Thank you so much again. I am really keen to get these ideas into schools. Please stay in touch! OH my gosh. . .I cant believe I MISSED it !! Nevertheless , I look forward to your NEXT one. . . I shall look forward to the next session. LOVE the book, but most of all LOVE your ‘discovery” being solidly comprehended and written about. It is so exiting for all these places and traditions to make sense to those of us who previously had NO Idea ! Thank you for such a lovely comment! 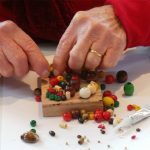 I would love others to take workshops. Maybe I should train some people to do so because I can’t manage it much myself because there is so much happening as a result of the interest in the book. A bad memory is a massive advantage in teaching these methods because you get to really understand the power of the methods once you have used them for a while yourself and can show off the memory feats. You know it isn’t your normal memory kicking in. I have an appalling natural memory which is why I started to ask the question: how could they possibly remember so much stuff? Thank you so much for your praise for the book. It is much appreciated.